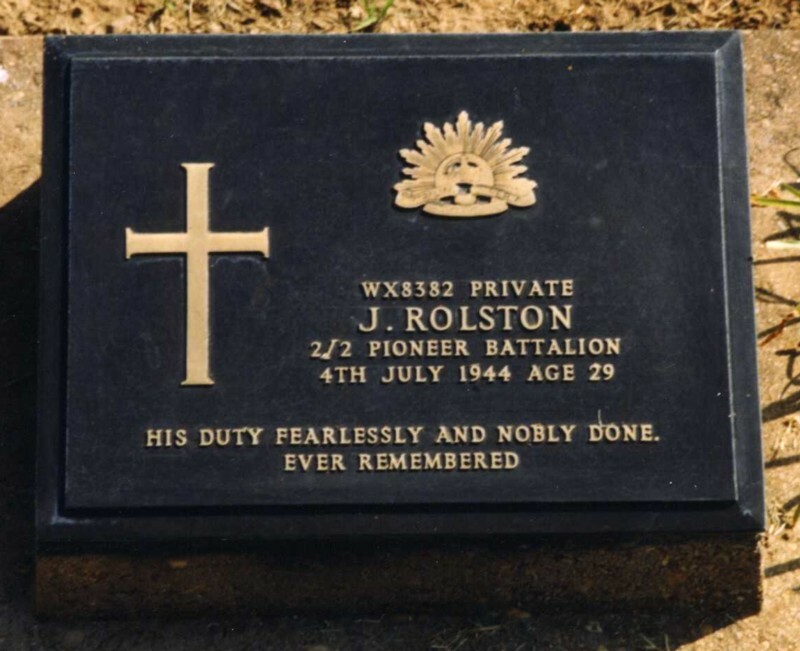 Background : Son of Joseph and Margaret Rolston, of Kellerberrin, Western Australia. Service & personal summary At enlistment : single. No previous military experience. Blue eyes, brown hair. 13/09/1940 Taken on strength general reinforcements Recruit Reception Depot Claremont, West Australia. 28/10/1940 Transferred to No.3 Depot Battalion Northam, West Australia. 29/10/1940 Marched in No.3 Depot Battalion ex Recruit Reception Depot. 27/11/1940 Transferred to 2/4 Machine Gun Battalion Northam, West Australia. 28/11/1940 Transferred from No.3 Depot Battalion. 01/07/1941 Granted pre-concentration leave from 01/07/1941 to 09/07/1941. 13/07/1941 Entrained for concentration Southern Command 4 Military District (South Australia). 16/07/1941 Detrained 4 Military District (South Australia) from 5 Military District (Western Australia). 02/10/1941 Entrained 4 Military District (South Australia) for 5 Military District (Western Australia). 04/10/1941 Attached Western Command General Details Camp for quarters and rations. 07/10/1941 Marched out to 3 Infantry Battalion. 07/10/1941 Strength increase. Marched in taken on strength ex Western Command General Details Camp. 10/10/1941 Marched in reinforcements 2/16 Infantry Battalion ex 3 Infantry Battalion. 14/10/1941 Granted pre embarkation leave from 14/10/1941 to 22/10/1941. 07/11/1941 Embarked overseas H.M.A.T. U.S. 13. 21/01/1942 Taken on strength from 21 Infantry Training Battalion. 21/09/1942 Previously reported missing in action now reported missing in action believed prisoner of war. 22/10/1943 Reported prisoner of war. 31/12/1943 Now interned Thailand camp. 04/07/1944 Died of illness (colitis, exhaustion) whilst prisoner of war. 08/02/1946 Reburial. Exhumed from Nakhon Pathon. Reburied Allied War Cemetery Kanburi Row 1 Plot G Grave No.53.